Receives Its First Ever Proper Release! 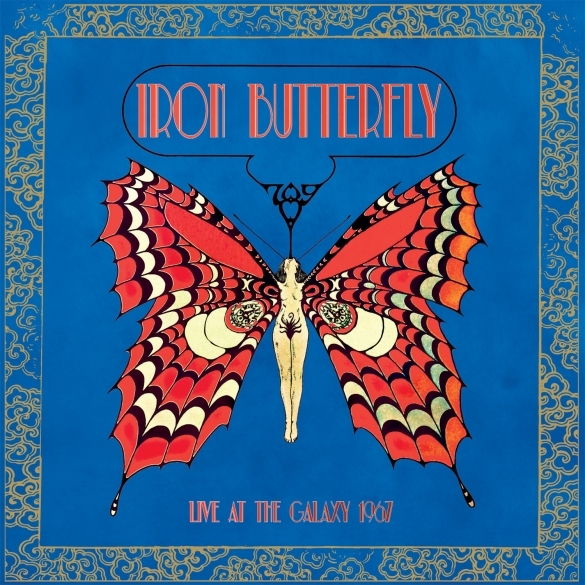 Los Angeles, CA – From the archives of ‘60s psychedelic rock comes this incredible live concert album showcasing the early beginnings of one of the most influential and legendary heavy psych bands ever, Iron Butterfly, available on CD and, for the first time, gorgeous 12” vinyl from Purple Pyramid Records starting May 27! Recorded at the historic Galaxy Club, which opened in 1964 just two doors west of the Whisky in the heart of the Sunset Strip, this brilliant performance features the rare early line-up of the band that recorded the monumentally important debut full-length Heavy: Doug Ingle (vocals, organ), Danny Weiss (guitar), Jerry Penrod (bass), Darryl DeLoach (vocals, percussion), Ron Bushy (drums). “Every big name act that was in LA came to see us play at the Galaxy,” says Bushy. “There was Eric Clapton, Jimmy Page, Jimi Hendrix, etc.” Atlantic Records showed up too, signed the band, and sent them into the studio to record what would become the band’s debut album. The set list from this night’s performance included “Possession,” Heavy’s monumental opening cut, and its far-sighted closer, “Iron Butterfly Theme” as well as “Fields Of Sun,” “Gentle As It May Seem” and “You Can’t Win,” all of them indicative of the Butterfly’s most powerful punch. And all of them performed by a band that was about to emerge from its cocoon to become one of the most adventurous, fearless and astounding bands to ever take flight – the mighty Iron Butterfly! This entry was posted on Saturday, May 17th, 2014 at 16:19	and posted in Iron Butterfly, Press Release. You can follow any responses to this entry through the RSS 2.0 feed.